I’ve been hearing some good things lately about The Comic Book Guide to the Mission from Skoda Man Press, so I though I would look into a little to see what was going on. The book is a compilation of 31 short pieces about San Francisco’s Mission District, all done by local writers and artists. The compilation’s pieces run the gamut from a pure celebration of the Mission to a critical look at some of the challenges of living there. There are also a number of pieces about Hipsters. But the book is not all celebration. A few of the pieces deal with the crime endemic to the district, as well as its issues with its homeless population. It also points out a that The Mission is overrun with Hipsters. Two pieces dealing with Hipsters are “Murray the Attorney” by Clint Woods and Nomi Kane, and “Field Notes from the Hipster Habitat” by Matt Stewart and John Mathis. Both of these do not portray Hipsters in the best of lights, but neither do they completely condemn them. Both are great reads. FOG! : What is your background and how did you develop an interest in comics? Lauren Davis: I think it surprised a lot of people that I published a print anthology, because I’m mostly known as someone who writes about webcomics. In college, I had that perfect intersection of the friend who was a comics evangelist (always loaning me his copies of Sandman and Johnny the Homicidal Maniac — some of which I’ve failed to return), easy access to the Internet, and way too much time on my hands to form the perfect webcomics junkie. I write about webcomics (and occasionally other things) at the science fiction blog io9, as well as my own (these days woefully fallow) blog Storming the Tower. FOG! : What is Skoda Man Press? Lauren Davis: It’s just me and my terribly abused laptop. How it got its name is kind of a silly story. My dog is named Dr. Emil Skoda (after the psychiatrist on Law & Order), and I’ve taken to walking around my house saying to my dog, “Who da man? Skoda man!” And thus a publishing house was born. FOG! : How did you decide to put together The Comic Book Guide to the Mission? Lauren Davis: I read a slightly absurd number of diary comics, and I had a thought that you could get to know an area through someone’s diary comics, just by having anecdotes or vignettes that are clearly rooted to a place. I’m not a cartoonist myself, so I decided to collect other people’s comics instead. FOG! : How would you describe The Comic Book Guide to the Mission? Lauren Davis: It’s a look at San Francisco’s Mission District through the lens of various writers, cartoonists, and other artists. I love how fully comics immerse you in someone else’s view of the world, and I wanted to see how one neighborhood would look through the eyes of different people with different visual and communicative styles. FOG! : What were the biggest obstacles you had to face putting the book together? Lauren Davis: When I started working on the book, I hadn’t been in San Francisco long and didn’t know many cartoonists. Fortunately, this was less a challenge than an excellent excuse to meet cartoonists. Lauren Davis: The book wasn’t really made with a target audience in mind, aside from people who might be interested in comics about the Mission. The actual audience has been extremely diverse — younger, older, men, women, people who’ve lived in San Francisco for years, and people who just moved here. I’ve even heard from some folks who moved away from San Francisco and love the book because it reminds them so much of being here. Lauren Davis: It’s funny, one of the pieces that I get the most feedback on is “Murray the Attorney,” about a young lawyer who has trouble fitting in with his hipster neighbors. Several people have told me that the piece reflects their own experiences in San Francisco (minus the legal superpowers). I think for a lot of people, it’s not about admiring or hating hipsters so much as seeing apparent tribes of people who dress a certain way and revel in a kind of creative weirdness and feeling like an outsider. And I can appreciate that. 8) Do you have any advice for someone interested in doing a project like this? Lauren Davis: When I started working on this project, I did a lot of outreach. I took a lot of people out for coffee and picked their brains about who might have great stories and which artists might have an interesting take on the neighborhood. 9) What does the future hold for Skoda Man Press? Lauren Davis: I’ve got some neighborhoods in mind for future books — and I’ve even talked with some folks about moving the project into other parts of the Bay Area. Plus, I’ve had so many people come and tell me they have a great Mission story that would make an amazing comic — so who knows? There may be a sequel in the near future. 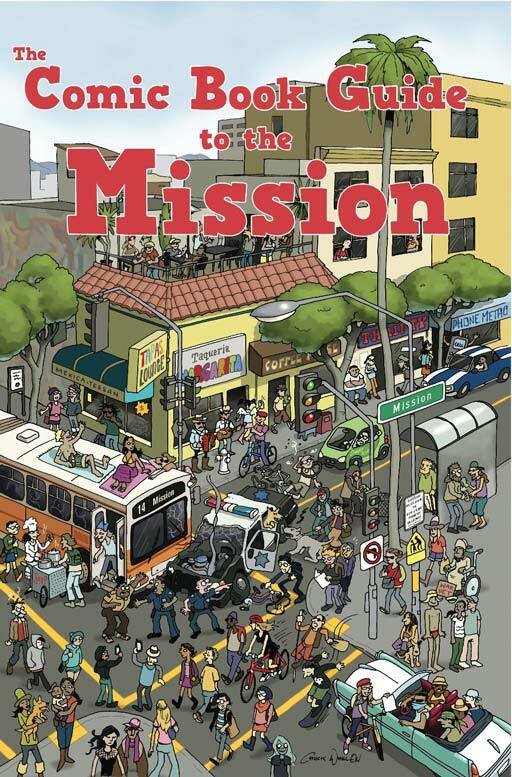 The Comic Book Guide to the Mission is available at Comic Shops around San Francisco and on Amazon. If you have ever lived in The Mission, been to The Mission, or are thinking of going to The Mission, this book will hold its appeal. I personally love the idea of getting to visit parts of the world via comics, and this book does an excellent job of giving the reader the full scope sense of what The Mission is all about. I hope Skoda Man Press continues to thrive and I look forward to their next project.